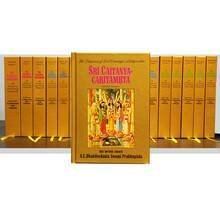 The life and teachings of Sri Caitanya Mahaprabhu in 17 volumes featuring the Bengali text with English equivalents, translation and elaborate commentary. 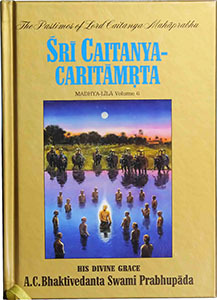 Profusely illustrated with hundreds of beautiful paintings and photographs. Original 1974 edition. 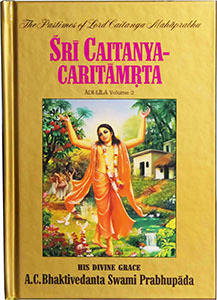 Sri Caitanya-caritamrta is the principal work on the life and teachings of Sri Krishna Caitanya, the Supreme Personality of Godhead appearing as His own devotee. He was the pioneer of a great social and religious movement beginning in India about 500 years ago that has directly and indirectly influenced the course of religious and philosophical thinking throughout the world. 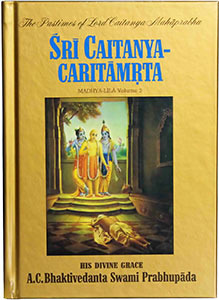 While the west was exploring the physical world, in India Sri Krishna Caitanya was exploring inward, exhibiting unparalleled spiritual potency, and discovering the truths of consciousness and transcendental reality. 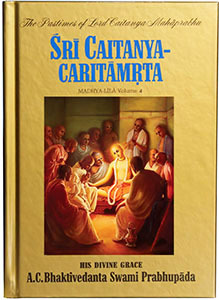 As a young boy Sri Caitanya overwhelmed and astounded scholars, establishing His own school at the age of sixteen. Within His lifetime He transformed India in four respects: philosophically, by defeating the greatest philosophers of His day; socially, by opposing the blindly rigid caste system; politically, by organizing India's first civil disobedience movement against repression by the Mohammedan government; and spiritually, by freely distributing nonsectarian love of God. 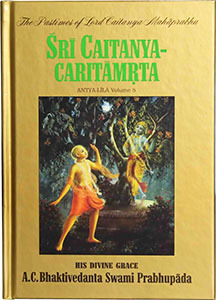 Sri Caitanya-caritamrta presents Sri Caitanya as the Golden Avatar, the incarnation of Krishna in this age in the form of His devotee. 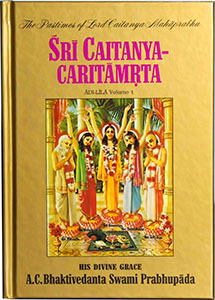 Lord Chaitanya introduced the chanting of the holy names of God as the prescribed method of God-realization for our time. 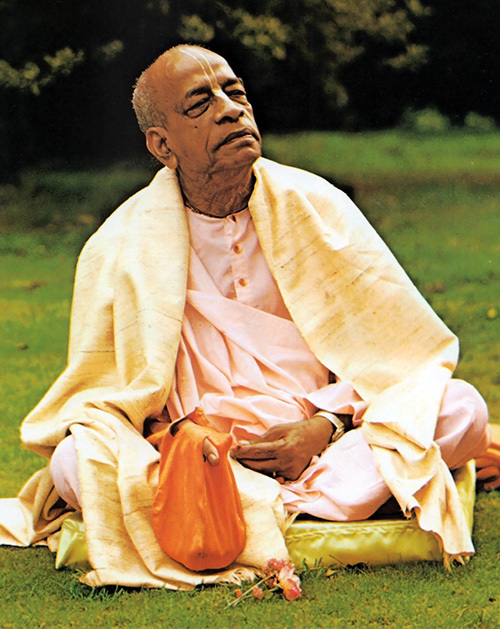 He began what is today called the Hare Krishna movement, since the movement's founder, Srila Prabhupada, comes in the Chaitanya line of spiritual masters. 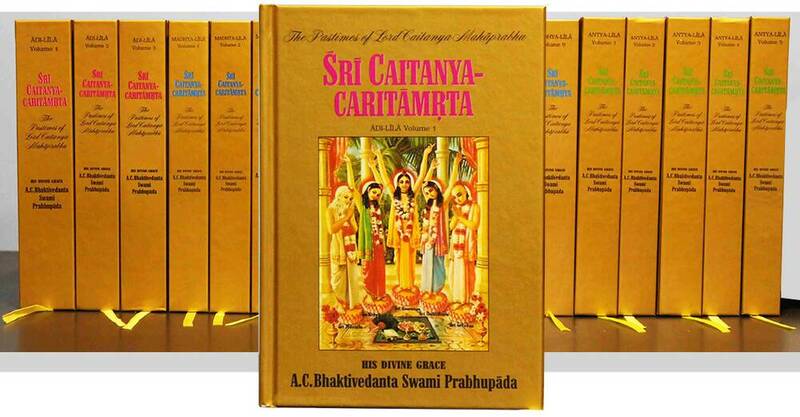 This Caitanya-caritamrta set is an exact replica of the first printing by Bhaktivedanta Book Trust in 1974-1975. All original color plates are included. 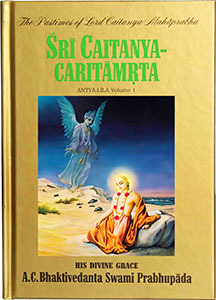 The pastimes of Lord Caitanya are divided into three divisions: Adi-lila (the pastimes in the beginning), Madhya-lila (the pastimes in the middle) and Antya-lila (the pastimes at the end). 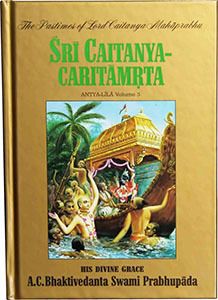 The Glories of Sri Advaita Acarya. 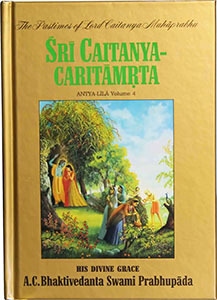 The Expansions of Lord Nityananda. The Pastimes of the Lord in His Childhood and Youth. 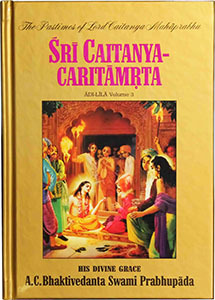 Lord Sri Caitanya Mahaprabhu's Stay at the House of Advaita Acarya. 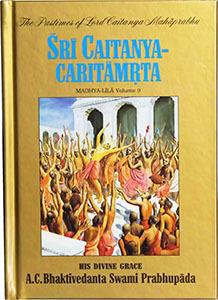 The Liberation of Sarvabhauma Bhattacarya. 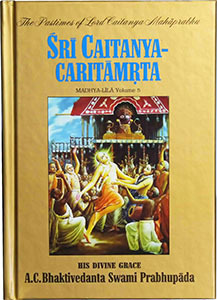 Lord Sri Caitanya Mahaprabhu's Travels to the Holy Places. 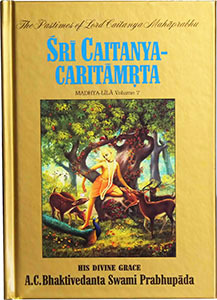 The Beda-kirtana Pastimes of Sri Caitanya Mahaprabhu. Performance of the Vrndavana Pastimes. The Lord's Attempt to Go to Vrndavana. 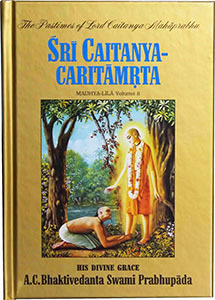 Lord Sri Caitanya Mahaprabhu Instructs Srila Rupa Gosvami. The Process of Devotional Service. How All the Residents of Varanasi Became Vaisnavas. The Glories of Srila Haridasa Thakura. 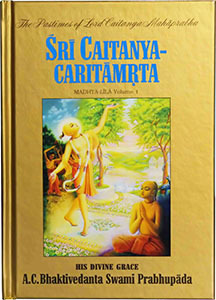 The Meeting of Sri Caitanya Mahaprabhu and Raghunatha dasa Gosvami. 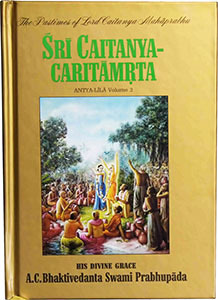 Sri Caitanya Mahaprabhu Accepts Prasada from the Devotees. 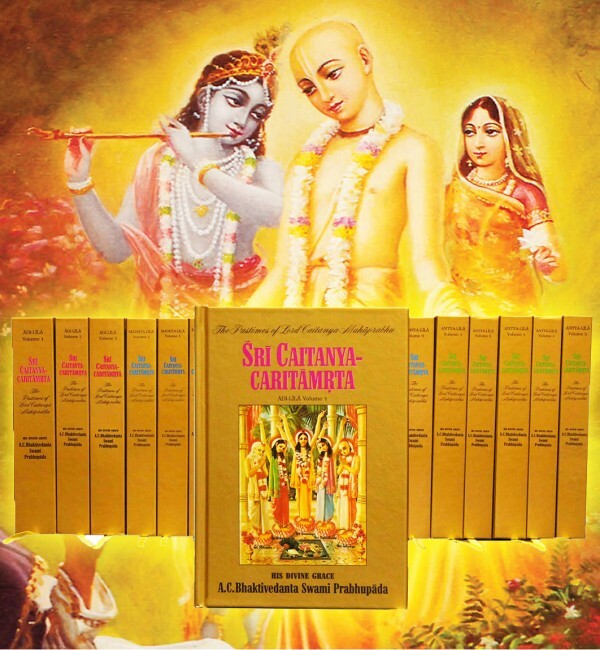 The Transcendental Madness of Lord Sri Caitanya Mahaprabhu. Question: Hare Krishna. 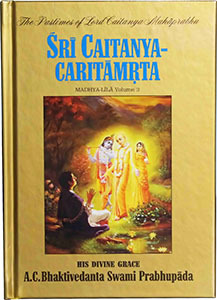 Can this be provided in Hindi as text? I want to buy full set, but only in Hindi.